If you are a high-earner and feel you are paying more and more tax, you are not alone. More than one in seven income tax payers are taxed at the higher or additional rate and they pay about two thirds of all income tax. Increasing the tax burden for higher earners has been a deliberate policy of successive governments. For instance, the thresholds for phasing out the personal allowance and the start of the additional rate tax threshold have both been unchanged since they came into force in April 2010. Although the point at which you start to pay 40% income tax is £46,350 for 2018/19 and increases to £50,000 for 2019/20 (except in Scotland, which has different income tax rates and thresholds), overall it has increased at well below the rate of inflation over the past ten years. You may also be feeling the impact of the tax on child benefit, which applies to those with income over a £50,000 threshold (frozen since January 2013), or you may be subject to the increased marginal rates of tax on dividends, introduced in 2016/17. The message is clear: if you want to reduce the amount of tax that you pay the solution is in your own hands. Planning could help you to lessen the rising tax burden – and we’re here to help. This guide explores a key tax planning opportunity: making pension contributions. Pension contributions qualify for tax relief at your highest rate, which may be 20%, 40% or 45% (41% or 46% in Scotland). The effective rate of relief could be up to 60% (61.5% in Scotland), or even higher, if your pension contributions help you to avoid the withdrawal of child benefit or your personal allowance. The guide also explains how a self-invested personal pension (SIPP) could help you to take control of your pension, and even to develop your business. Income tax rates and thresholds have not kept pace with inflation, which means high earners should be aware of the tax-planning opportunities open to them. The generous tax reliefs successive governments have given to pension arrangements mean that they have long played an important role in tax planning for high earners. However, since April 2011 increasingly tight restrictions have been placed on these reliefs, just as the rising burden of income tax has made them more valuable. The amounts you can pay in and take out without suffering heavy tax charges have been reduced greatly, but pensions continue to offer significant tax benefits. Before age 55 you can pay into a pension but cannot take anything out unless you are in serious ill health. Between age 55 and 74 you can pay in or draw out (or do both at once), which gives you real flexibility to manage your income as you move into retirement. From age 75 you can no longer receive tax relief on pension contributions, but you have a free choice of how much or how little you draw out each year. Pensions can also play an important role in combatting another tax that may concern you and your family: inheritance tax (IHT). The table below summarises the key tax benefits. Your personal contributions to a pension normally qualify for income tax relief at your marginal rate(s). Most commonly, individuals pay 80% of their contribution and the pension scheme claims the remaining 20% from the government. These rates apply across the UK, so income taxed at the 19% starter rate in Scotland gets 20% tax relief. If your highest rate of tax is over 20%, you can claim the balance under income tax self- assessment. Pension contributions reduce your taxable income so they can help you to avoid the phasing out of the personal allowance, which starts at £100,000 of income, resulting in an effective tax rate of up to 60% (61.5% in Scotland). Contributions can also help you to sidestep the additional rate tax band, which starts at £150,000 of taxable income, or the high-income child benefit tax charge, which affects those with income over £50,000. Pension contributions can offer a particularly effective way to reduce your tax bill whilst also helping you to prepare for retirement so you should make sure you are aware of all the options. Esther, who lives in England, has total income of £112,000 for the tax year 2018/19. Her personal allowance is reduced by £1 for every £2 of income over £100,000, meaning she loses £6,000 from her personal allowance. As a higher rate (40%) taxpayer, she pays £2,400 on this extra taxable income. If she makes a pension contribution of £12,000 including the tax relief, this reduces her relevant income and she recovers her full annual allowance. In addition, she gets the full 40% tax relief on the contribution, amounting to £4,800. This means that the £12,000 contribution only costs her £4,800 (£12,000 – £2,400 – £4,800). This is equivalent to tax relief of 60%. The rules on limits for tax relief are complicated. Total contributions, including deemed contributions to an employer’s defined benefit scheme (e.g. a scheme that provides a pension based on your final salary) must be kept within an annual allowance to avoid tax charges. For the 2018/19 and 2019/20 tax years, this annual allowance is £40,000, but it reduces for those with ‘adjusted income’ over £150,000 and it is just £10,000 for adjusted incomes of £210,000 and over. ‘Adjusted income’ includes pension contributions paid by an employer or deducted from your pre-tax pay in addition to normal taxable income. Regardless of your earnings, the maximum contribution to your pensions (excluding any defined benefit schemes) without tax charges falls to just £4,000 once you have started to receive payments from your pensions flexibly. Some exceptions to this rule apply, for instance if you take a cash-free lump sum to buy certain lifetime annuities. There are some special rules that may allow you to catch up on the pension contributions you could have made in the previous three tax years. In 2018/19, you can exploit your unused annual allowance dating back to 2015/16, while in 2019/20 you can go back to 2016/17. This is known as ‘carry forward’. The rules are relatively complicated in their application, but, in theory at least, if your earnings are high enough and you have not paid into a pension in recent years, it would be possible to make up to £160,000 of pension contributions in 2018/19 or 2019/20 with full tax relief. If this type of planning could be relevant to you, then please seek our professional advice. Both the calculation of unused relief and the identification of contributions to tax years are often not straightforward. Elaine has paid £20,000 into her pension in the ‘input periods’ for each of the three tax years 2015/16, 2016/17 and 2017/18. She can carry forward £20,000 (£40,000 −£20,000) from each of these years – a total of £60,000. She can add in £40,000 for the tax year 2018/19 and contribute up to £100,000 in that year, assuming she has sufficient earnings to qualify for tax relief on the whole amount and that her adjusted income is not over £150,000. If you have not used all of your annual allowance in the last three tax years, the carry forward rules let you bring the unused amounts into the current tax year. Whether or not you wish to maximise your pension contributions, it is well worth spending some time on the payment arrangements. If you are an employee, then you (and your employer) can save national insurance contributions (NICs). The secret is for you to reduce your salary or your bonus and ask your employer to use the money, including the NIC saving, to make the pension contributions for you. The technical name for this is salary or bonus sacrifice and it is perfectly legal, if you do it correctly. While the government has recently clamped down on many other salary sacrifice arrangements, it has specifically given the green light to those involving pension contributions. If you pay higher or additional rate income tax, the result could be an increase of around 18% in the amount being paid into your pension. Your ability to borrow money, g. for a mortgage. Your entitlement to redundancy payments or other benefits, such as statutory maternity pay, working tax credit or child tax credit. Pension schemes and providers generally offer a wide range of investment funds, which meet the needs of most people. However, if you have already saved a substantial amount, a self-invested personal pension (SIPP) offers you the opportunity to take control of your pension investments. A SIPP gives you a much wider choice of investments to suit your priorities and preferences, and if you have your own business you may be able to use your pension to help develop it tax-efficiently. For example, you can hold commercial property and company shares in a SIPP, or you can build up a portfolio of investments. A SIPP also offers a flexible and tax- efficient way to turn the pension fund you have accumulated into an income for your retirement. There are, however, downsides to SIPPs which will be touched upon later. If you want more control over how your pension funds are invested, you may want to consider a SIPP, which allows you to choose how your savings are used. A SIPP is a special form of personal pension that allows you, as the pension scheme member, to choose and control the investments within your pension plan. SIPPs are offered by most of the major providers, including investment platforms, insurance companies and specialist pension firms. Whilst SIPPs allow a large range of investments, some options may not be appropriate for you such as direct investment in overseas property or derivatives. Most SIPPs include funds and quoted investments, which you may hold alongside your other assets. It is important that your investments are integrated as far as possible and considered together in your financial planning. A key consideration is ensuring that your investment portfolio balances risk and reward in a way you are comfortable with. This will take account of the time horizon of your investments as well as your individual attitude. This will largely be reflected in asset allocation, which is simply the balance between secure but low-growth investments, such as cash deposits, and more risky but higher-potential investments, such as company shares. You will also need to consider the selection of investment funds/index trackers, which are likely to make up a large part of your portfolio, and ensure they are suitably diversified and reviewed regularly. The taxation of investments can also help determine whether they are held inside your SIPP or elsewhere in your investment portfolio. Changes to the taxation of interest payments and company dividends from 6 April 2016 – with another reduction to the dividend allowance from April 2018 − may have altered your position. Many of us build up several different pensions over the years. Some pension funds may still be with former employers, while others are those we have saved ourselves. Some may have high charges and under-performing investments. Consolidating old pensions into a SIPP can reduce charges and allow investments to be made that meet your needs better. This must be done with caution. Some employer schemes have very low charges, so you could pay more after switching to a SIPP and you will need to be confident this is justified by the additional investment flexibility. Even more importantly, you must be careful about giving up guarantees in your old pension arrangements. Some older arrangements, which are usually on a ‘with profits’ basis, guarantee the terms on which you can convert your pension fund into an income through an annuity. Guaranteed annuity rates can give you a pension that could be twice as high as buying the best annuity available on standard rates today, but this may be subject to restrictive terms. A major attraction of SIPPs is that certain types can invest in commercial property. Commercial property can be let to the pension scheme member’s company or partnership. You can even sell a property that you or your business owns to the pension scheme (although this might result in a tax charge on any capital gains). Any sale transaction must use an arm’s length valuation, because there are tax penalties for ‘value shifting’, for example undervalued sales to your pension scheme. Similarly, the business must always pay a full commercial rent, which the SIPP will receive tax free. A SIPP can borrow up to 50% of its net assets for property investment (or any other purpose). Often SIPP property purchase is financed by a combination of transfers from previous pension arrangements, new contributions and borrowing. Andrew has a SIPP with total assets of £300,000 and a personal pension valued at £100,000. He decides to transfer the personal pension into the SIPP, and can then borrow £200,000 (50% of £400,000) and spend up to £600,000 on a commercial property. SIPPs that hold commercial property as an investment normally have higher annual charges than simpler pension arrangements with investments in listed securities, collective funds and cash. In theory, almost any investment can be held in a SIPP, but those that are not approved by HM Revenue & Customs are subject to heavy tax charges that make them unattractive. They are known as ‘taxable property’ and include, for example, residential property, works of art, antiques, fine wine and other collectables. The maximum tax charge on taxable property can be 104% of the investment’s value, most of which would fall on the member. Some forms of indirect investment in property and chattels are exempt from the tax penalty, but the definitions are strictly drawn. Unfortunately, the way in which the legislation operates will potentially catch a controlling director’s pension scheme investing in the shares of their own unlisted company. While there is a limited exemption for indirect investment in chattels with a market value of no more than £6,000, many providers ban investment in chattels and member-related unlisted securities. However, some SIPPs do permit investment in suitably structured residential property funds. Since 6 April 2015, the rules have provided much greater flexibility once you reach the minimum pension age of 55 (which increases to 57 in 2028). There are no restrictions on how much income you can take each year from drawdown, and you can take 25% of your pension funds as a tax-free lump sum at the start, with subsequent withdrawals taxed as income. There are also no restrictions on withdrawals from a pension, but the first 25% you take is tax free and the remainder is taxed as income. The best way to structure withdrawals from your pension will depend on your personal circumstances. We can give guidance on how you might take lump sums and income from your pension, including ways to combine them with other income sources, what happens if you die and when it may be beneficial to buy guaranteed income through an annuity. We can also help you understand how you can take advantage of the flexibility now available. Samira has a SIPP with a value of £600,000. After taking financial advice, she decides to ‘crystallise’ £400,000 by moving £300,000 to drawdown and taking £100,000 as a lump sum. The £100,000 is tax free as it is a quarter of the £400,000 total withdrawal. She decides to keep the remaining £200,000 ‘uncrystallised’ she needs it, when she can take 25% tax free. Assessing your financial priorities and recommending a tailored retirement planning strategy. Maximising pension contributions, using carry forward where appropriate. Advising whether salary sacrifice could increase the amount invested in your pension at no extra cost to you or your employer. The appropriateness of a SIPP, and the right investment strategy. Transferring existing pension arrangements into your new pension arrangement. Managing the move from saving to withdrawing from your pension. 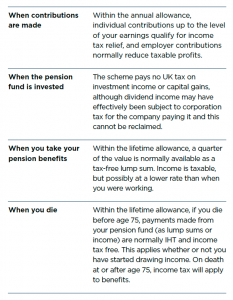 Minimising IHT liabilities after your death. This publication is for general information and is not intended to be advice to any specific person. You are recommended to seek competent professional advice before taking or refraining from taking any action on the basis of the contents of this publication. The Financial Conduct Authority does not regulate tax advice, so it is outside the investment protection rules of the Financial Services and Markets Act and the Financial Services Compensation Scheme. This publication represents our understanding of law and HM Revenue & Customs practice as at 20 November 2018.